When we moved here 18 months ago one of the things we missed was good inexpensive restaurants. Boston has all the chain restaurants like Seattle, but we had a group of mom and pop places that we loved Cabby Shack, Hola, La Paloma, T Bones, The Milepost. The food here is different from back East and I have finally accepted that. We have found a few places that we like, but we are still exploring. On Wednesday I met my friend Jamie at Machiavelli’s on Capital Hill. It is one of her favorite places for Italian. 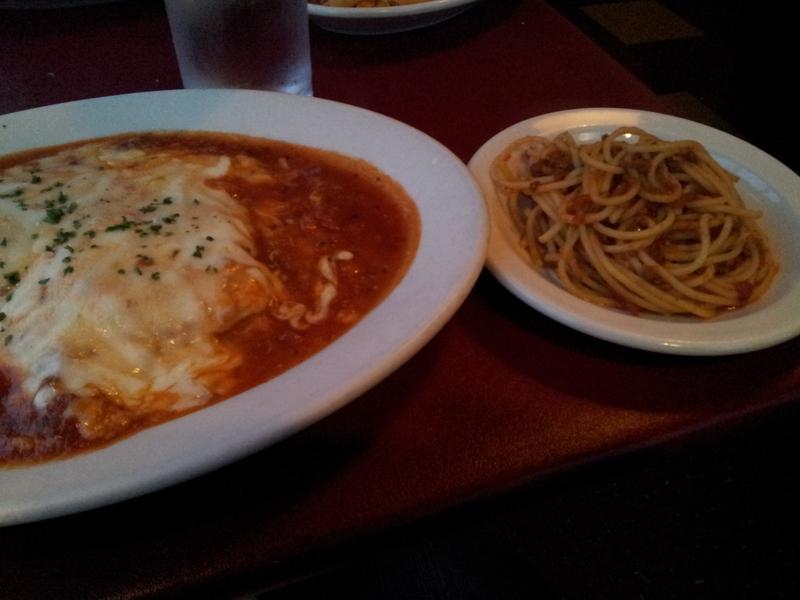 I had to go with the traditional chicken parm which was very good. The best I have had in Seattle. I only wish they had cannolis, but I will be back. On Saturday Larry and I went to the Brave Horse Tavern in Southlake Union. It is a great pub/bar. The pretzels were awesome. 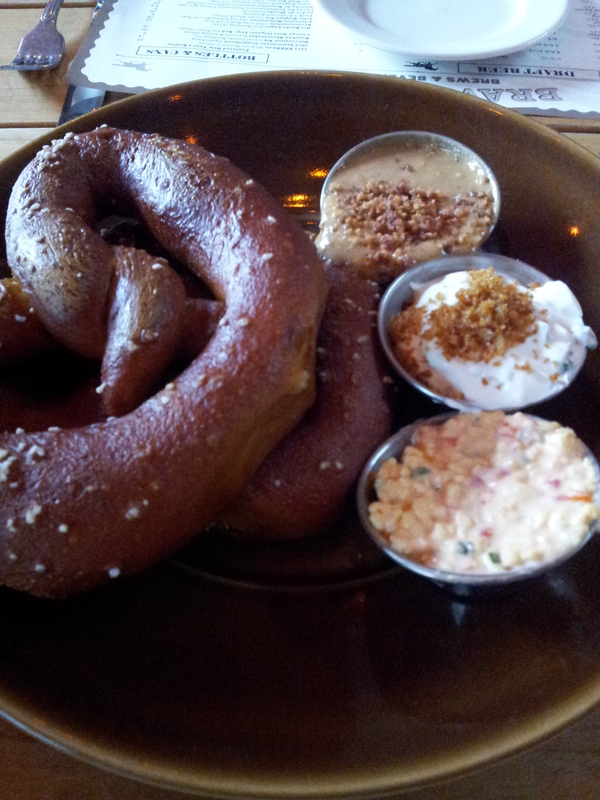 The dips were peanut butter bacon, sour cream chives and roasted pepper cheese. My fish sandwich was not so good, an Arby’s fish sandwich would have been better for half the price. Running is going well. I ran in Bellevue on Saturday with ESR and it was super hilly. 6.4 miles with an elevation gain of 1300! On Sunday Amy and I ran 5 miles then met the group at the Balanced Athlete. I saw a family of bald eagles on the run, they are pretty impressive. Do you have any favorite restaurants in Seattle or Eastside? This entry was posted in Uncategorized and tagged Brave Horse Tavern, Machiavelli's, Running. Bookmark the permalink. Some of our favorite family owned restaurants are: Black Diamond Bakery, Testy Chef in Maple Valley (they are testy chefs but a wonderful view of the Cedar River right off the Cedar River running trail and it’s always busy) and one of my favorite Italian spots is Pizzutos in Columbia City. I will keep thinking. Thank you for the recommendations! We are always looking for places to try. I love love love Revel in Fremont (Korean), the Ballard Annex for mountains of Seafood, and Queen Sheba in Capitol Hill for an inexpensive Ethiopian feast. Thanks for the recommendations Sam. I have been to Dalia and did like it. I think we will have to try the Ballard Annex, I love seafood.